INTRODUCTION: Our public lands, including Wildernesses, are sprinkled with "inholdings" - small parcels of privately-owned land, often old mining claims. Several dozen parcels exist inside Eagles Nest Wilderness; statewide, about thirteen thousand acres of inholdings exist (and nearly half a million acres nationally). 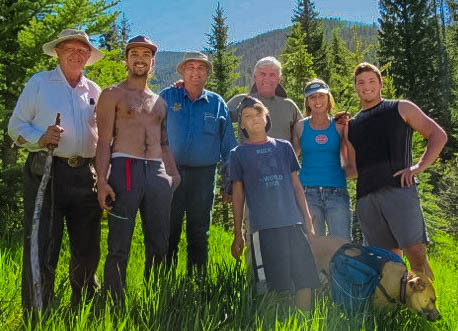 Some have cabins, including, in Eagles Nest Wilderness, the Orphan Boy cabin on Keller Mountain, the cabin on Deluge Creek, and the subject of this month's newsletter, the Cabin on Bighorn Creek. Owners of inholdings follow different drummers when it comes to use. At one extreme are those who show little concern for wilderness, who want to develop or sell their properties for big profits. Tom Crawford is everyone's poster child of such a person, "gaining leverage by threatening to destroy something priceless, then cutting a deal" (Outside Magazine). Headlines like "Controversial luxury home inside a Colorado National Park is up for sale" (Denver Business Journal), " and "Tom Chapman Pisses Off Telluride With Private Ski Area Plans" (Curbed Ski) have told some of his stories. At the opposite end of the spectrum are people like the Walker and Gartside families, who have owned the rustic Cabin on Bighorn Creek for more than a century. 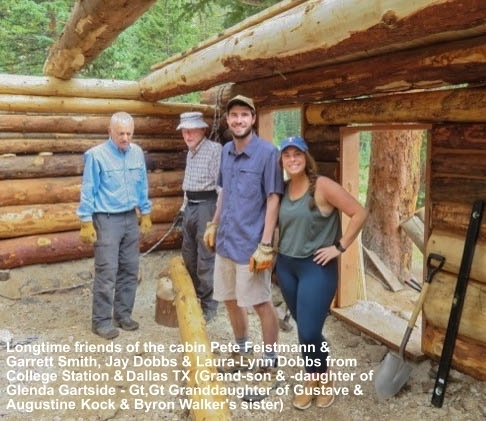 This past summer, they got together, and with help from numerous friends and passersby, they restored the cabin (see also Vail Daily article), using original tools and techniques. As in decades past, they intend to make the cabin available for emergency use by hikers or skiers in distress. Read about the history and restoration of the cabin below. We have been asked to write a brief on our cabin, known to many as the Bighorn Hilton, for your newsletter. 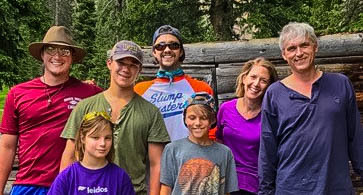 This past summer my brother Andy and sister-in-law Renee, organized and motivated four generations of our family, friends and many long time soulmates of the cabin from the Vail Valley, Eagle and Summit counties to restore the cabin. We were joined by many visitors from around the World who pitched in for several hours while on their hikes. For over a hundred years the cabin has been first a home and then a destination rest spot and emergency shelter for hikers, climbers and back country adventurers. With the cabin restored we hope that it will continue to provide shelter and historical intrigue for the next 100+ years. 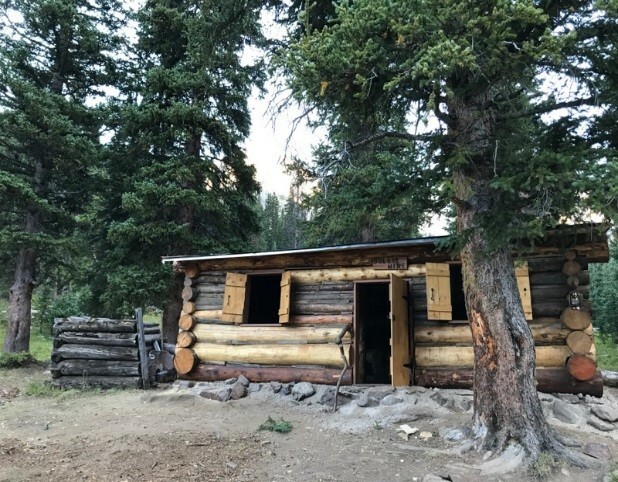 HISTORY: The cabin was built in the 1890s by our great, great, great, Uncles and Grandfather who had come west with gold fever from Buffalo, New York after immigrating from Germany in the 1860s and 70s. The cabin housed some of these folks and served as the camp cookhouse. The small room adjoining the cabin was the ore house and storage room. There was also a two story 10-person log bunkhouse just south of the cabin, a full blacksmith’s shop (cabin) at the mine entrance, corrals, horse and mule shelters and an outhouse - which stood (until the 1990s) a short trot from the cabin. Water was piped from Bighorn creek to the mine and blacksmith’s shop and to the cabin and bunkhouse. The current Bighorn trail joins the old wagon road to the cabin at the Wilderness Area sign after the ½ mile climb from the trail head. The mine reached its peak production in the early 1900s producing more than $50,000 in silver and a little gold (equivalent to $ 1.3M in 2017). Production stopped sometime in the 1930s. In 1955 the entrance to the mine was closed by a cave-in. The last time the cabin was lived in year around was in the mid 1970s. Our family had several other mining and business interests in the area - including the Ground Hog Mine on Battle Mountain - and it opened the Eagle River Hotel in Minturn in 1914. Many family members made Minturn their home and continue to do so today. RESTORATION: The cabin restoration was done using the same building techniques and hand tools that our ancestors used, Including a brace and bit that we think was used on the original cabin. The cabin is the exact same size. Some of the construction differs slightly as required to meet current code. Original cabin material was used when possible. 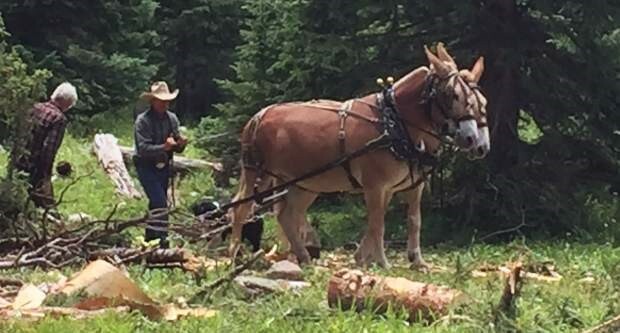 Tom Burch of Halfmoon Packing out of Leadville drove mule trains to pack in and out supplies and tools. We cut down 9 green trees. Renee plans to re-plant 18 using saplings provided by the US Forest Service in Minturn. We met with USFS staff in Minturn to try to coordinate as best we could. We wanted this to be a model cooperation between USFS and an inholder and we had a good relationship. We met with Aaron Mayville and Marcia Gilles and Marcia visited the site early on. We tried to use standing dead or re-use logs from the cabin. I would not recommend this. The standing dead starts to rot even if it is vertical and almost all of the old logs from the cabin had some rot. I'd recommend all new logs in future projects. We had to peel them even if they were old. Some of the new trees peeled very easily because there is a layer of sap between the bark and the wood. The older trees were very difficult to peel and we only partially peeled them. The cabin is a combination of peeled, partially peeled, and unpeeled logs and we wanted it that way. We used logs from the old cabin to fill in between windows and doors and to the sides of windows. We did this by cutting the rotted ends off the longer cabin lengths to provide the shorter lengths. This worked well, because, the facade that you walk up to near the door and at eye height is all old logs from the old cabin. Mule teams were used to skid logs from where they occurred to the site of the cabin, and then adjacent to the cabin. From there they were rolled up log ramps onto the structure with ropes and come-along winches. They were notched to cover the log below them on each end and stacked. First we did a list of all the logs we had with length and diameter of each end, then we did a stacking pattern which was like a puzzle to figure out how the end diameters best matched up. 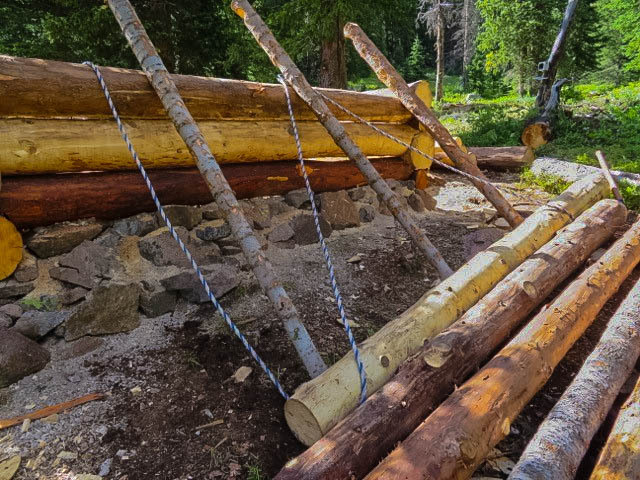 Fasteners were used at the corners and along the length of each log. The cracks between logs were chinked on the inside with backer rod and a modern chinking material called Log Jam, and the exterior is chinked with wood strips re-used from the old cabin. In the future we plan to restore a wood floor to the cabin. Currently the floor is fine gravel. Mules hauled up over 200 2x6 planks for the roof deck, as well as ice and water shield, roll roofing, and flashing. The roof was installed mainly by Josh Walker and his friend Rachel. Byron Walker fabricated glass windows that were hauled up by Alex Walker. Wooden shutters were made on-site using planks hauled up by the mules. Please respect and help protect the property so that future generations have emergency shelter if needed and can enjoy the history of the area as well. Some Walker family members L to R, Alex Walker- Grandson, Shay - cousin (from Canada! ), Josh Walker - Grandson, Renee Azerbegi-Walker -Daughter in Law, Andy Walker-Son, Front: Ember Carlton - Byron’s Great Granddaughter, Kirby Walker -Grandson. Some Walker Family members L to R, Byron Walker - Great Grandson of Gustave and Augustine Koch original settlers, Josh Walker - Grandson, Victor Walker-Son, Andy and Renee Walker - Son and daughter-in-law, Alex Walker-Grandson, Front-Kirby Walker-Grandson and Layla - Kirby’s Dog. 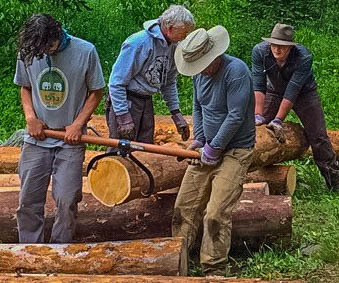 Become a Volunteer Wilderness Ranger in 2018. Details. In 2016, more than 50 VWRs contacted more than 12,000 hikers. Greet & teach!